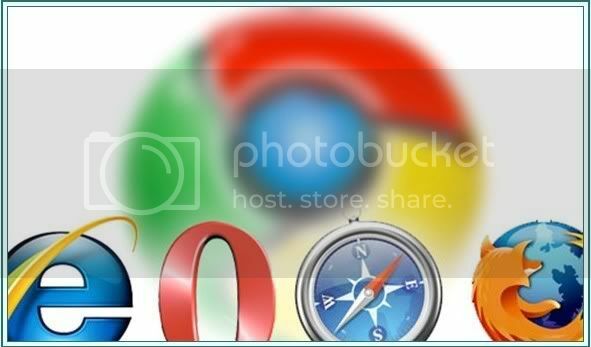 Instead of a plain new blank, Chrome's New Tab will have up to nine thumbnail images of your most visited webpages. There's more: on the left of the thumbnail area, there's a list of recently used search engines, bookmarks and closed tabs. 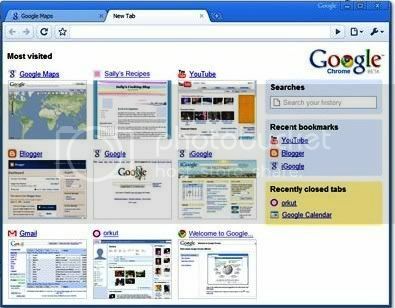 1~Each tab have its very own set of toolbar with other tabs. 2~More viewing area reclaimed by having the tabs at the top makes use of empty space next to the minimize, maximize and close buttons. ~Some may argue that Chrome's Address Bar is somewhat a clone to Firefox's "Awesome Bar". Well, it might be BUT it's a little shrewder I would say. You only need to type a few letters into the address bar and the browser will suggest the sites you've visited recently or a bookmark that matches. As you already knew, each tab of Chrome opens as an individual process. So you can actually close misbehaving sites loading in individual tab without affecting the other tab pages. What's more? Well, Chrome have its very own Task Manager for killing misbehaving tab. Similar to Windows' Task Manager, you can bring up Chrome's Task manager by hitting Shift+Esc (or clicking the "page" icon and then go into Developer/Task Manager). With Chrome's Incognito, you can surf to your heart's content then just close the tab when you're done without any history, cookies or passwords stored in the browser's cache afterwards. Some might say it's similar to Explorer 8's InPrivate feature, BUT Incognito will only affect the tab where you've turned it on unlike InPrivate that affects the entire browser. So, Chrome came out winner here! The Create Application shortcuts in the Page menu is a big plus for those who like Google Docs. By choosing this when you have a window open, Chrome will format a special window without the usual browser buttons and create a shortcut to it on the desktop which allows you quick access to it. Will Chrome dominates the others? So, that's more or less about this Chrome beta. Surely it still have a few flaws and minor hiccups since it's still a beta. But I must say that Chrome have surely blown the others away! But as far as adhering to web standards, Chromes got 79% in the Acid3 test, a common test for whether a web browser conforms to web standards. I also tested the other browsers with the test: Firefox managed to churn out 71% whereas Opera and IE failed terribly. So are you guys still pondering whether to switch to Chrome or not? For me, I'll still stick with Firefox. But there's no harm trying right?